An engine from an Airbus 320 US Airways aircraft that splashed down into the Hudson River is recovered. 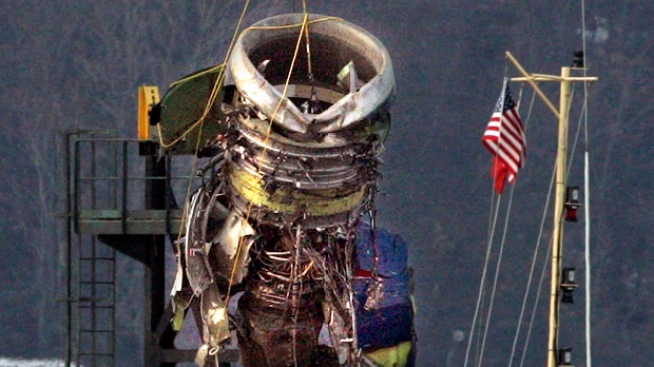 The battered, twisted left engine of the US Airways plane that crash-landed in the Hudson River was recovered Friday, after an eight-day struggle to find the wreckage and pull it from the murky water. Using a large, floating crane, salvage crews from Jersey City, N.J.-based Weeks Marine gently set the engine on a barge. Shards of metal and wiring hung from the engine, and a large portion of the outer shell appeared to be missing as it was lifted from the river bottom, 65 feet below the surface. New York Police Department and New Jersey State Police harbor officers, working with a federal sonar expert, on Tuesday located an object 16 feet long and 8 feet wide on the river floor, near where Flight 1549 made its emergency landing Jan. 15. Divers confirmed Wednesday the object was the Airbus A320's engine. Then salvage crews began the tedious work of rigging cables and securing the engine to remove it from the frigid river. The engine didn't appear to be leaking any oil or fuel, though a steady stream of water gushed out as it was lifted. Immediately after the engine was set down, National Transportation Safety Board investigators began documenting and photographing it as part of their probe into the remarkable landing. The Charlotte, N.C.-bound plane splashed down in the river after hitting a flock of birds and apparently losing power in both engines shortly after takeoff from LaGuardia Airport. All 155 people on board survived. Earlier this week, the NTSB said the right engine revealed evidence of “soft body damage,'' and “organic material'' was found in the engine and on the wings and fuselage. A single feather also was found. The NTSB said samples of the material have been sent to the U.S. Agriculture Department for a complete DNA analysis. A spokesman for the U.S. Army Corps of Engineers, which helped recover the engine, said rapid river currents posed a problem for divers earlier in the day Friday. “We're continuing to make sure the work area is safe by collecting dirt and debris that is coming down the river,'' spokesman Thomas Creamer said. The engine will be taken to Weeks Marine's facility in Jersey City, where the rest of the plane was shuttled by barge over the weekend.